Nutrition accounts for about 80% of the effectiveness of any program. That’s my unofficial estimate from years spent training clients in person and online. What you eat (and what you don’t) makes the difference between good results and phenomenal results. Am I going to use the dreaded “D” word….oh no…not diets…It's okay, I don’t believe in diets, well at least not in the usual meaning of the word. I don’t like diets, they imply temporary, restrictive, boring and definitely tasteless. No thank you, I 'aint doing that and I don’t expect you either. Now a healthy Meal Plan– that’s something else all together. Let me explain the secrets of a Super hot actress, and the hidden weapon of the action hero – they eat. But not just in any way – oh no, they eat really tasty, extremely nutritious food that supports and enhances their goals. So let’s do it. This is another huge advantage of Online Personal Training with me. Meal Planning is a hassle, and one you won’t have to deal with. 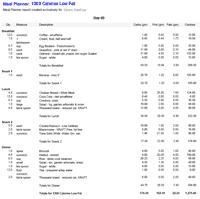 I assess your current meal plan based on another incredible questionnaire. Then, and this is the really cool part, I count the exact number of calories you need to achieve, accentuate and accelerate your goals, be it a weight loss, weight gain, anything and design a tailor made meal plan for you. Each Meal Plan covers your whole week, and every meal in it from sunrise to sunset. Each food is listed and I even provide you with breakdowns of the different proteins, carbs, and fats for each item, meal and day. I do the same for the calories. You know exactly what to eat, when, how – the lot. Of course with that information you can go and enter your own substations, look at the nutritional information of the food and if it’s close to what I’ve listed, enjoy! I can even design one with your favourite foods. No food is taboo, so you aren’t forced into eating food that makes you miserable. I wasn’t going to mention it, but there a couple of bonuses for my clients (like personalised grocery lists and my own personal favourite recipes). Now that we know the value of Nutrition it’s time to look at an important question - What Results can you expect with Online Personal Training? Now that we know the value of Nutrition it’s time to look at the important question What Results can you expect with Online Personal Training?